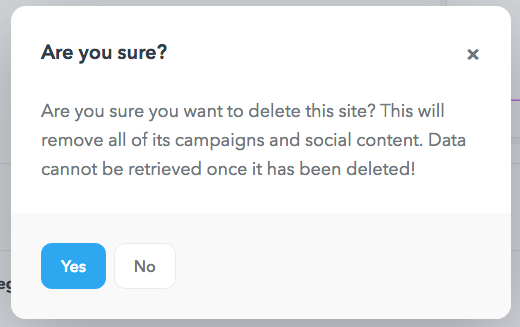 From the site selection drop down, choose the site you wish to delete. Once the site's dashboard is loaded, open the Settings dropdown. Within it a 'Delete Site' option is visible. Clicking on it will open a popup asking you to confirm your decision. 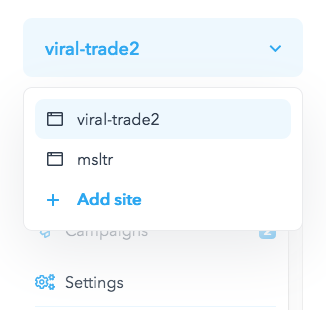 Clicking 'Yes' here will delete your site from Missinglettr. That is it, your site is now deleted from Missinglettr. P.S. Deleting a site from Missinglettr does not affect your actual website or blog in any way.